Following South Carolina’s secession on December 20, the pace of developments in the sectional crisis picked up dramatically. Even as efforts continued in Washington to find a compromise that was acceptable to the North and the South, Major Robert Anderson, acting on his own initiative, abandoned Fort Moultrie, on the shore of Charleston harbor, and transferred his troops to Fort Sumter, in the middle of the harbor, it being a far more defensible location and fort. That was December 26. The next day, “South Carolina seized Fort Moultrie, Castle Pinckney, a lighthouse, a Federal schooner and other [federal] government property.” On December 29, Secretary of War John B. Floyd resigned. 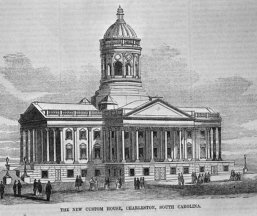 On December 31, “South Carolina added the United States arsenal, the post office and the customs house in Charleston to the spoils of her as-yet-undeclared war.” Quoted in Agatha Young, The Women and the Crisis, Women of the North in the Civil War, 1959, pp37-38. On January 3, Georgia seized Fort Pulaski, near Savannah. On January 4, Alabama seized the US arsenal at Mount Vernon, and the next day, Forts Morgan and Gaines, in and near Mobile Bay. President-elect Lincoln spent January 4 interviewing prospective cabinet members. President Buchanan, in light of the seriousness of the situation, proclaimed a National Day of Fasting, which few people observed. On January 5, the Senators from the Southern states caucused in Washington to discuss how to deal with the situation. On January 6, Florida seized the Apalachicola arsenal (on the northwest coast of the state), and the next day, Fort Marion, in St. Augustine. The Union soldier manning Fort Marion refused to surrender it unless he was given a receipt for it. He was given the receipt and the fort was taken without shots being fired, as was also the case with the other federal properties. On January 6, the mayor of New York City proposed making New York a free city, which would have permitted the port to be open to tariff-free shipping by both the North and South.